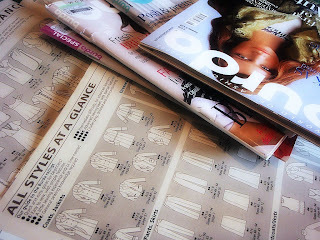 This week's space is filled with Burda World of Fashion magazines. I am looking for the right project to take to my dressmaking class, which resumes next Tuesday evening. I would like something challenging this term. I've never sewn a collar on a stand or plackets before, so a coat or shirt would fit the bill. Oooh, that looks a lot like Ottobre, or any magazine with patterns actually. I have found that once you get started tracing off, it is really much easier to follow the line you're after than you might think. Always up for a challenge. I love that about you. I'm sure you will be fine - and a master of the collar stand and placket in no time! 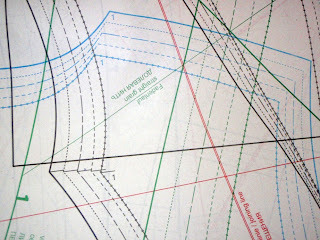 What I do for Burda patterns is to trace them onto tracing paper (my local spotlight usually have a packet of 2 of tracing paper for patterns like this) or onto thin sew in interfacing (it doesn't tear as easily as tracing paper). What IS that thing with all those scary lines?! Eeek. Translator required. I picked that magazine up at the newsagents this morning and then after looking at that pattern page I quickly put it back again. I am sending you lots of good tracing and following vibes. it all sounds very exciting though! but the lines, they looks like major engineering plans, which I guess they are in a way! Yep they do look just like the Ottobre ones, make sure you do them when you have good light or they send you cross-eyed! They look a fair bit easier than the japanese books ive been tracing from. The books i have dont have differently coded lines like the burda ones. At least you understand the instructions too. I havent learnt japanese yet! Good on you for having a go. Collars are very satisfying - enjoy! Gulp. Those all on top of everything patterns scare the living daylights out of me! Hats off for giving it a go. All the best finding your pattern in that maze! Looking forward to seeing what you decide on making. Whoo, that sounds ambitious to my amateur seamstress ears. Good luck! While visiting my mother in law a little while ago, she told me that she traces her patterns onto lightweight interfacing - because you can see through it and it folds well and it's easy to cut (and keep - in a binder with plastic pockets actually). She buys the white interfacing when on special. Having used tracing paper and cardboard I think I will try her idea next. Esp because I've been subscribing to Ottobre for about 6 months but have been so put off by the overlapping pattern pieces!